Home / arsenal fc / Mesut Özil / Ozil Out! The abbreviation of back spasm is BS! Ozil Out! The abbreviation of back spasm is BS! How do you abbreviate back spasms? It’s a rhetorical question, so you don’t need to answer. 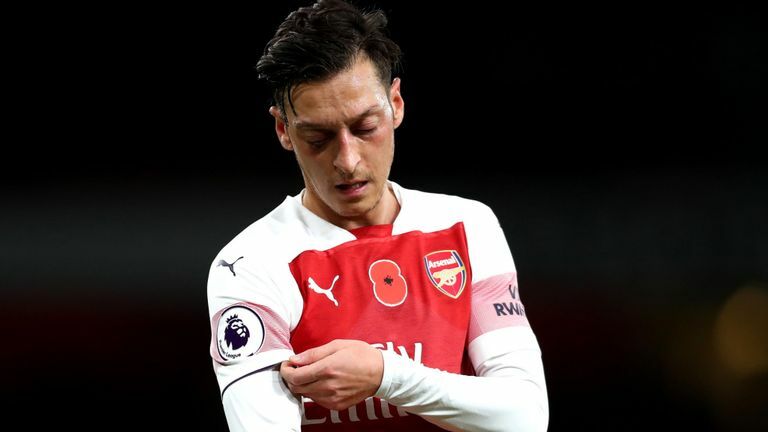 Of course, Mesut Ozil knows what it means: fake news or a ruder phrase for that. For him, it means the end of his Arsenal career potentially. Obviously, there will be some people that believe the club’s official comments about Ozil, but they’re the type of fan who believes in Santa still. The club, quite sensibly, are hiding the truth. 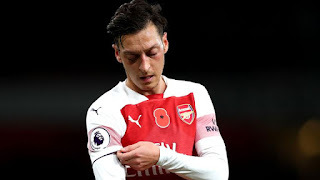 Meanwhile, many fans have guessed that Ozil is disaffected after being dropped for the Bournemouth game and his next move will be to defect. I’ll be surprised to see him in an Arsenal shirt and after the team weekend trouncing of Spurs, many will feel the German is surplus to requirements, especially as he can’t completely adapt to Unai Emery’s pressing game. That involves more energy than the wan one has got in his tank. Ozil is like a sports car, which is no good in the heavy traffic of Premier League midfields. At least he still has some re-sell value, so Arsenal must flog him while they still can. On the subject of tanks, (well, I mentioned one several sentences ago), Kolasinac or Stanley Yelnats as I like to call him, proved to be an effective armoured truck against Spurs. He exemplified the physicality of the new Arsenal. He was aided and abetted by Sokratis, or George Clooney, as I’ve dubbed him and Torreira, who is like garden gnome in size but a million times more useful. Those three tough nuts transformed Arsenal from a team of powder puffs into the ‘A’ Team that Gunners fans have been craving for. As well as that, the fitness level have soared to a level that’s beyond belief. Tottenham are hard-workers, but Arsenal put them to shame in terms of endeavour. Meanwhile, I read that the pundits are finally coming around to the idea that Aubameyang is the top striker in the Premier League. I was worried that playing on the wings would blunt his sharpness, but that hasn’t happened. Once Lacazette entered the fray as well, Spurs really struggled to contain Arsenal’s forward line, which possess the pace that their rivals lack. Had Emery not made his bold half-time substitutions, the result could have been very different, though. The ineffective Mkhitaryan was hauled off, as was Iwobi and the two subs made all the difference. Aaron Ramsey deserves a lot of the credit, as not surprisingly to me, he looks at home in the number 10 role. After that performance, he should retain his place in the starting line-up. Despite the convincing rout of Spurs, turning over Manchester United will be no small matter. If Arsenal can get a draw or a victory at Old Trafford, it will be a remarkable achievement, particularly as it’s Emery’s first season in charge.